It was like the start of a new term with everyone greeting each other and wondering how they’d settle in. Clearly Chantelle Harding and Katy Weston took no time at all to settle and in their first match overpowered Carolyn Armstrong-Smith and Geri Brooksbank by 6 games to love. There were plenty of 40-all points with Katy serving very well but Chantelle’s enthusiastic sprinting and alacrity won the match. The second match between the experienced Lucy Davis and Angela Probyn against Trish Morris and Margaret Wareing (Canford) started very evenly. 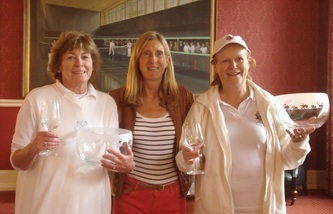 Trish played elegantly with a very 'hard to return' serve and Margaret showed some promising shots which forced a win over Angela’s very effective ‘dolly’ serve and the tricky cut of Lucy’s serve. 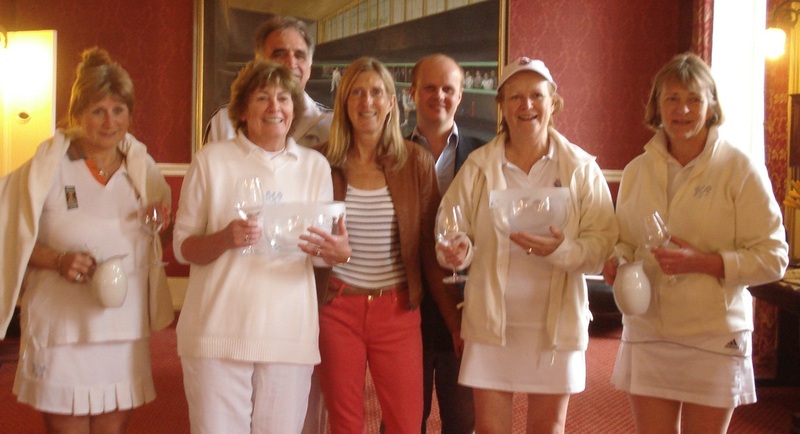 Pam juggled organising the tournament and playing with her partner Diane Binnie – it is to both their credit that they won all of their matches in the group. Three matches were as close as could be, (6-5), and amazingly the eventual winners were beaten 6/0 by Pam and Diane in the group stage. The pairing of Gabrielle Smart-Fourquet and Sarah McGivern proved forceful, elegant and a lesson in placement. They gradually built on their success learning what worked and finished fourth in the group. 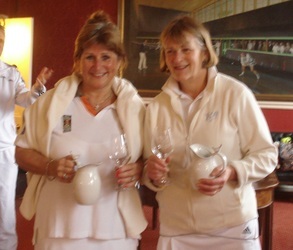 Candida Nicholls and Annabel Wyatt had got used to each other’s game and having the closest handicaps were tipped to do well, sadly no-one told them! The combination of Candida’s running and returning and some lucky serves from Annabel enabled them to secure a second place in the group but had they peaked too early? Carolyn and Geri had see-sawing games where they were ahead and then lost and, equally, behind and then won! 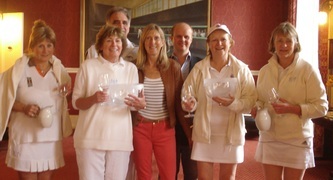 Carolyn’s elegant play and Geri's gentle determination had opponents confused as to how to play them. The dinner on Saturday evening in the splendid Club dining room was sumptuous (our thanks to Charlotte) and we were graced with the company of Leamington’s Chairman Guy Stanton, professionals Kevin Sheldon and Mark Seigneur and Mark’s wife Georgiana. Much chat and laughter was had over the food and wine. Sunday morning arrived all too quickly and the nine o’clockers were quiet on court but invigorated by the Lansdowne Hotel’s ‘Blind Poached Eggs’ - a circle cut out of the toast under the egg and placed over the yolk of the egg (much to Sarah’s annoyance who bemoaned ad infinitem the leakage of the egg yolk through the hole in the toast)! Matches were close again, proving that the handicap system (mostly) works. The first four pairs would proceed to the semi-final and these proved to be Pam and Diane, Annabel and Candida, Chantelle and Katy and trailing in fourth place Gabrielle and Sarah. 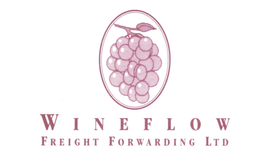 By lunch on Sunday the mood had lightened and Carolyn (our generous sponsor) broached the subject, raised by Candida on ‘Twerking’. A fairly comprehensive explanation was given and illustrated by Candida but after Kevin’s pleadings she did not repeat this! The first semi-final of Pam and Diane versus Gabrielle and Sarah was to prove a shock with the previously vanquished (6-0) Gabrielle and Sarah now turning the tables and winning 6-2. The second semi-final of Annabel and Candida versus Chantelle and Katy was a replay of the match immediately before lunch but again the winners were to become the losers in this semi-final too. Chantelle and Katy won 6-3. The final was an excellent match full of excitement and ‘edge of seat’ watching. Chantelle and Katy started stronger but Gabrielle and Sarah were not about to give up. The games frequently went to 40-all and there was hardly a point to choose between them. Both pairs deployed the ‘player up’ guard to the galleries and it seemed to be a ‘genteel’ slugging match between ‘Terrier’ Chantelle and ‘French Bulldog’ Gabrielle! It could easily have gone either way but Gabrielle and Sarah clinched it 6-5 in a 40-all final game. of organising the event (particularly having to cope with last minute drop outs) and Kevin and Mark for being true professionals and marking so splendidly. The LRTA is always made to feel very welcome at Leamington. Mark Seigneur said “this is a very well organised tournament with very little hassle”. Many thanks to Carolyn Armstrong-Smith and Pam Tomalin for the photos.